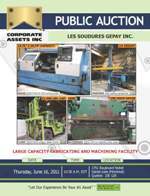 Corporate Assets Inc. | Les Soudures Gepay Inc. - Corporate Assets Inc. FEATURING: ACCURPRESS (1998) 725012, hydra-mechanical press brake, ALLSTEEL 10’ X 3/8” hydra-mechanical shear, PANDJIRIS 14' X 14' welding manipulator, PANDJIRIS 11' X 11' welding manipulator, RANSOME 15000 lbs. welding positioner, IRCO 10000 lbs. welding positioner, CULLEN FRIESTED 6000 lbs.welding positioner, RANSOME 2500 lbs. welding positioner, ARONSON 1000 lbs. welding positioner, tank turning rolls, ERCOLINA TOPBENBER tube bender, PEDDINGHAUS 210/16 mechanical ironworker, PEDDINGHAUS 210/11 mechanical ironworker, PIRAHNA P3 hydraulic ironworker, WEBB 8’ pyramid type plate bending roll, CLARK C500HY300D 21000 lbs. diesel forklift, KOMATSU 5000 lbs. forklift, MAZAK (1988) QUICKTURN 25 CNC turning center, MAZAK (1986) VQC 20/40B CNC VMC, TOS FN 40C gap bed engine lathe, HARDINGE HC chucker,GARDNER DENVER 50 HP rotary air compressor, DEVILBISS 14’ X 25’ X 9’H spray booth with l PYRADIA 8’ X 16’ X 8’H natural gas fired curing oven, RICHARDS WILCOX 2 ton free standing crane system, (40) welders, drill presses, pedestal grinders, magnetic base drills, power tools, hand tools, electrical supplies, welding supplies, steel tables, lifting accessories, office furniture, business machines & more.